These days we’re trying to reinvent technologies with an eco-friendly factor added to it. To achieve this, most of our current technologies have to be pursued in a different form. But I believe the end result is worth it, we’re investing not only in the product but in environment itself. These are the thoughts in my mind which gave me the fuel to work on ‘Bamboo Cycle’. Was this the product I decided to work on initially? No. But when I, encouraged by my friends, pursued my thought further along the lines of eco-friendly products, this seemed to be a perfectly viable and after a bit of study, technically feasible work. And then further discussions bore fruition, and lo within a short while, we found ourselves working on the project. I put forward the idea of Bamboo cycle, strongly backed by team mates and the highly encouraging and enthusiastic management granted us funds immediately. Mission Bamboo cycle was initiated and we started listing down all the works. 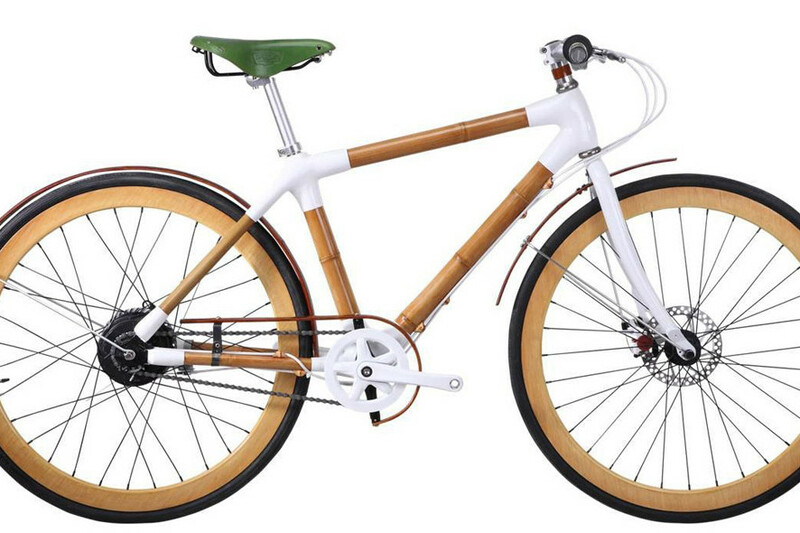 A Bamboo cycle needs a hollow, long and strong bamboo sticks, heat source to strengthen it and some bonding agents. 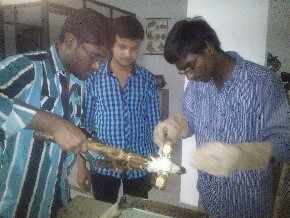 So along with my team which includes Sai Kiran, Sri Teja, Sumedh, Venkatesh Babu, Venkatesh, we set upon pursuing the idea. We prioritized the work needed to be done. First we distributed various works like obtaining required materials, making various calculations and pooling resources that are available in the college among ourselves. I took the responsibility of identifying sources for obtaining various materials and in that process I enquired many shops in Koti, Rani Gunj. Finally after a search for a week, from a friend of mine, I got an online link of a Butane Gas Flame Torch that could serve our purpose of heat treating the Bamboo. Meanwhile the calculations and required dimensions were calculated and obtained. Now comes the most important part, how do we get bamboo?, Uhm! To find one, fortunately, we just had look around our college; Narsapur forest apart from being famous for its wildlife is also famous for its high and dense collection of Bamboo trees. So we decided to utilize that natural source and with help of a friend we managed to enter a small extended area of that forest which was certified to be safe by the Regional Forest Officer. As forests are known for their maze like structure, taking inspiration from movies, I made some marks on trees which we passed by so that we could successfully find our way back. It took us around 3 hours to find suitable bamboo sticks and cut them down. We bought them and left them near the gate security office and relaxed for the day. Finally we started building the frame. After taking inputs from our faculty members and availability of labs, we chose Machine Tools Lab and got ourselves comfortable with the ambience. 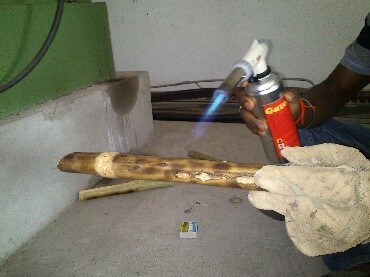 It was important for us to prioritize our works in order to effectively complete the work on time; so few of us got into cutting the bamboo in required dimensions, half of the remaining team were dedicated to heat treating the bamboo in order to get a light brown colour which signified its strengthening phenomenon. 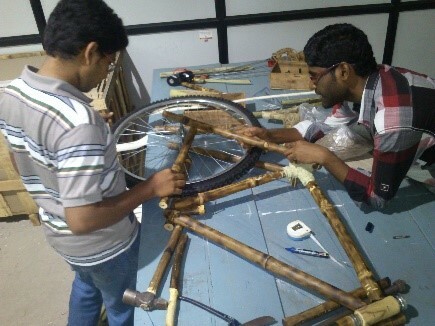 Rest of us took an empty table, drew the design of frame with required dimensions and nailed the the corners to increase the grip of bamboo sticks when they are placed. Since classes were equally important, we decided to work in the nights. I still remember those days, when we worked for some time and then in the process of relaxing we played cricket in the lights of street lamps, converted the lab as a sleeping area in the nights, a place where we debated over various affairs, played Antakshari. Fighting for the chance to take the last sweet in dinner in the canteen, playing in the rains will definitely make me nostalgic down the memory lane. After successfully getting all the bamboo sticks and arranging them on the table, we had two important works. First was to join them to make a frame and second was to test the heat treated bamboo to know how much the strength actually improved. So I decided to take up the task of testing, so along with one of my teammate we tested a sample of heat treated bamboo with a metal and a normal bamboo of same size. We took the help of Mechanics of solid Lab and conducted various test like Impact test, tensile test and results were promising. 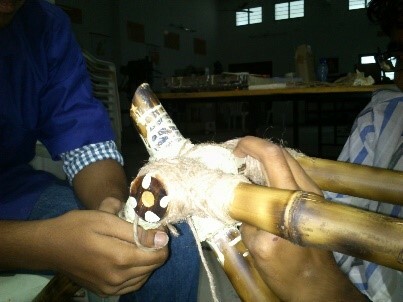 Meanwhile we identified that a combination of Coconut fibres and Epoxy bonding will give a good strength to joints. Fortunately my friend’s father was a dealer of these fibres so we initially ordered for a smaller quantity of fibres and got Epoxy bonding agent. After successfully testing it on a sample, we decided to use it. Meanwhile I insisted one of my teammates, Sai Kiran who possessed excellent artistic skills to document the designs and calculations for future reference. After laborious work of joining the sticks to get the suitable frame, we bought various cycle accessories required from Narsapur and assembled it. Finally we could get the shape and appearance of a cycle, however due to ignoring the seasonal effects on bamboo and some minor angle deviations, we had to redesign some of our joints. Finally we bought the cycle from an ideation stage to a product stage. However we are yet to do the testing part and with some minor modifications we are all set to get the cycle on roads. This project of ours not only gave us a platform to practically utilize the subjects we learn, but also boosted our confidence drastically, improved our working abilities as a team and of course gave us a lot of memories to cherish marking its presence in the essence of my student life. Previous storyMy tryst with BVRIT.